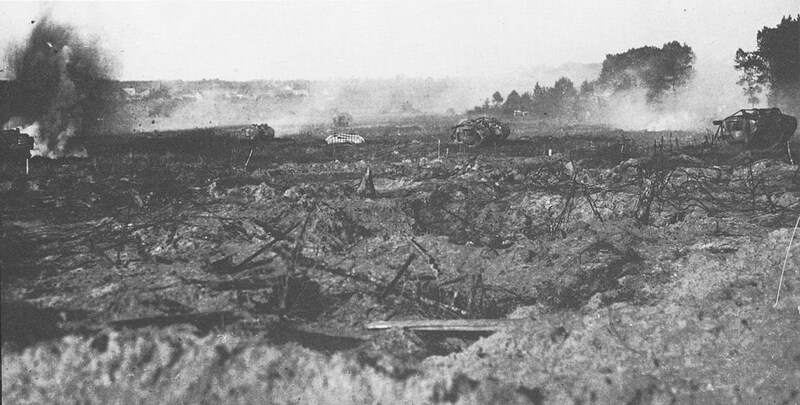 Mk Vs of the 301st (U.S.) Battalion taking a German trench. October 1918. In the spring of 1918 a British Army had waited grimly for an attack by forces that it knew would be overwhelming; in the autumn the pendulum had swung and it was Germany’s turn. This time it was not along a single stretch of a few miles but the whole front from Dixmude to the Argonne Forest, some 250 miles in all, that was on the move. From King Albert’s men in the north to Pershing’s in the south blow after blow was falling upon the battered Wehrmacht and nowhere would it be more stunning than on the sector under Sir Douglas Haig. The mighty Hindenburg Line had as a part of its protection the two canals of St Quentin and the Nord. These had in peacetime carried, as they still do, the big seagoing barges upon which so much of French commerce depends, though in September, 1918, the Canal du Nord was dry. In only two places were there no impossible tank obstacles, along the 4½-mile stretch called Le Grand Souterrain between the villages of Hellicourt and Vendhuille in the north and the thousand-yard-long Le Tronquoy Tunnel just north of St Quentin. The decisive battle opened on 27 September and it lasted for fifteen days. It began on the fronts of Home’s First and Byng’s Third Armies, with a drive across the old Cambrai battlefield towards Bourlon Hill spearheaded by fifty-three tanks, sixteen of them old Mk IVs and the rest Mk Vs. Here it was necessary for them to get over the dried-out canal between Bourlon and Marquion as best they could. It did not look easy, for the canal was 50 feet wide at bottom, 12 feet deep and with banks of 9 feet scarped by German engineers into almost vertical faces. This was Baker-Carr’s parish, with his Brigade supporting the Canadian Corps. Elles was in London, as Tank Representative at the War Office, and his replacement, Colonel Karslake (later of Quetta earthquake fame) came to Baker-Carr’s HQ ‘with the avowed intention of stopping me from wasting tanks on an impossible task’. He got no change from Baker-Carr. His own Reconnaissance Officer, Williams-Ellis, had made some very daring visits on his own and Oswald Birley – famous in another sphere but then First Army’s aerial photograph expert – had agreed that the thing could be done. Karslake retired in a cloud of gloomy prophecies. A plan was proposed ‘by some genius’ that half-a-dozen time-expired tanks should be strengthened and made to serve as a bridge. Baker-Carr, unconvinced, agreed to let it be tried. Not one of them reached the canal, but this did not prevent a colourful account of how ‘the wonderful feat was accomplished’ from appearing in the Press. As things turned out every fighting tank, ‘first one, then another, then two or three at a time, negotiated the “insuperable obstacle” and appeared going strong on the far side.’ The ‘swallow-dive’ learned at Bovington had paid off. Bourlon Wood and Bourlon Village both fell after some hard fighting to the same battalion, ‘G’, which had attacked them at First Cambrai. Two days later, in a dense fog that made it necessary to navigate by compass, more tanks crossed the Canal to the south. The infantry fought their way to the outskirts of Cambrai itself. On the Fourth Army front, further south, were concentrated most of the still serviceable tanks, about 120 in all. Numbered among them was the United States 301st Battalion whose Mk V and Mk V Stars were in support of 27th (New York) Division. There was not a rat-hole in a canal bank whose existence and location was not known to Fourth Army Intelligence but there was one particularly worrisome factor about the now imminent battle. Three very important positions from which the route of the attackers would be commanded, the Knoll, Quennemont Farm and Bellicourt, had not fallen as expected during the preliminary battles. The original intention had been that the inexperienced American Divisions should not be put in until these features had been secured. Once again Sir Henry Rawlinson was faced with a hard decision and once again he refused to shrink from it. The 27th Division, with its own willing consent, would have to attack the outpost line on 27 September and have it securely in their possession before the main attack began on the 29th. Twelve British tanks were allotted to them. Resistance was strong and the attack failed utterly. The result was that another fearsome decision had to be made. The British artillery was now a superb instrument and the orchestration of barrage plans was as demanding as the scoring of a Beethoven symphony. Small bodies of American troops were known to be somewhere in the zone upon which the barrage must fall, along with many American wounded. If the plan remained unchanged they were in mortal danger; if it were to be tinkered with the barrage would be ineffective. With great courage General Read, the US Corps Commander, accepted that the lesser evil would be to carry on as arranged and let the men lost in front take their chance. Even as it was, the fact that the Germans still held Quennemont and the Knoll meant that the Americans would have to start a thousand yards behind their barrage line and risk being cut up by machine-gun fire as they tried to catch up with it. The veteran German machine-gunners were presented with unmissable targets and the US troops were laid in swathes, just as the British had been on the Somme. The 301st Tank Battalion moved off to bring them some help. Then came one of the war’s tragedies. During the early days of the March retreat, when rumours of German tanks were running wild, a line of mines – 50 1b mortar bombs filled with ammonal – had been laid exactly in the path they were about to take and had been forgotten. Probably the men who had put the minefield there were all dead. The US tanks, following carefully laid tapes, rolled straight into it. The mines went off in a succession of roars, ten tanks were blown up and many crewmen were killed. So powerful were the explosions that the bottoms of most of the victims were completely torn out. Another milestone in tank history had been passed. The crews that had passed it safely kept going. Worse was to follow. As the mist lifted, large parties of Germans emerged from the tunnels and began to shoot into the American ranks from behind. The Australians, following up, dealt with them as only the Australians could but so long as Quennemont was untaken the American advance would make no headway. Something had to be done, and done at once. Major Hotblack has appeared before in this story. Even among the brave men of the Tank Corps his reputation was that of d’Artagnan and this was his hour. His position as head of Tank Corps Intelligence gave him no tanks to command but the moment was critical. Hotblack commandeered the two nearest, Mk Vs of the 16th Battalion waiting their turn, and headed through the storm of steel straight for the ridge. The tanks were on their own, no infantry being anywhere near but Hotblack did not hesitate. The pair drove unscathed up the south spur of the Quennemont Ridge, generally regarded as inexpugnable, drove the Germans off it and killed those who did not run. As soon as the German artillery tumbled to what had happened every gun in the neighbourhood was switched on to the two intruders; inevitably both were quickly destroyed. That, however, was by no means the end. Hotblack, partially blinded, with another wounded officer and five or six men brought some captured German machine-guns into action and held the immediate counter-attack at arm’s length. Soon they were joined by an Australian officer, then by an American, each with his orderly, who had come to find out what was happening. The newcomers took a German gun apiece and brought the strength of the garrison to about a dozen. Twice during the previous week the ridge had been held in force but German counter-attacks had pushed the trespassers off. This time a dozen heroes kept them at bay for several hours until the first of the infantry arrived and took over. By that time every man had wounds of some kind to show. With even a part of Quennemont ridge in Allied hands the battle took a turn for the better. One cannot let Major Hotblack simply disappear from the story. His latest wounds, for he had almost as many as Bernard Freyberg, took him out of the remainder of the Kaiser’s War. On 17 April, 1940, the First Lord of the Admiralty, Mr Churchill, picked him to take over command of the troops in Norway. After being briefed at the Admiralty until late at night he set off through the black-out and suffered a stroke whilst on the Duke of York’s Steps. He was not found until next morning and was later boarded out of the Army. A sad end to such a brilliant career. 175 tanks, including those of the unlucky 301st, attacked the Hindenburg Line on Michaelmas Day. 46th (North Midland Territorial) Division of Walter Braithwaite’s IX Corps performed one of the most remarkable feats of arms ever, crossing the Canal at Bellenglise by scrambling down the steep banks, swimming or wading across and then up the other side, driving the Germans before them. This being hardly tank work, the crews had to wait until they could cross the tunnel; that done, they swung south, worked down the far bank and added greatly to the German discomfiture. The armoured cars drove impudently into Bony, on top of the Souterrain, but were soon hustled out again. Strong though the Hindenburg Line was, it was out of date by September, 1918. General Gouraud, in the last German attacks in Champagne, had demonstrated what a modern defensive system should be. His strength lay in depth, a depth far exceeding that of what the Germans called the Siegfried Stellung. The front lines were lightly held by sacrificial units and easily taken. Only then did the victors realize that these trenches were packed not with men but with land-mines and mustard gas. By the time these novelties had shaken them they found themselves beyond the range of their own artillery and were shot down by companies. The position in front of the British armies was a line in the most literal sense. Once broken there was not much behind. The breaking, however, looked to be a prodigious task. Immediately to the front lay acres of wire, not in lines but in an ingenious chequerboard system. Behind the wire were deep dug-outs, built as carefully as any housing estate, in which the infantry and machine-gunners could take their rest immune from the heaviest of barrages. To cut the wire sufficiently for infantry to have any chance at all of getting through ought to have taken the British batteries a very long time; they would probably have succeeded in the end but that would only have meant launching unarmoured men through a jungle of torn-up spikes straight on to the waiting machine-guns, whose crews could have remained under cover until the last possible moment. When the works had been constructed the designers had bargained only for such an old-style attack and the tanks captured at Bullecourt had given them no cause to think again. The Mk V, with all its faults, was their undoing. Haig’s plan turned over to the Tank Corps virtually all responsibility for dealing with the wire and a good part of the business of eliminating machine-gunners. Every tank that could be made serviceable had to take its part. Once their first duty had been carried out the infantry could take over and storm the lightly fortified areas beyond. The Corps performed nobly. Its machines took heavy punishment, but from the standpoint of the Army as a whole it was a sacrifice well worth making. Sir Archibald Montgomery put it rather mildly in The Story of The Fourth Army; ‘September 29th was perhaps the most trying day the tanks had experienced during the hundred days, but they earned the sincere gratitude of the infantry by their never-failing gallantry and self-sacrifice whenever they were called on for assistance.’ It would have been no exaggeration had he said that, lacking them, the task might have proved impossible. The heaviest burden fell upon those leading the Australian-American Corps, the 4th and 5th Brigades. Only a part of their strength was to be used on the first day, for all experience emphasized the need for reserves to be kept for reinforcing success. It was on the front of 46 Division, however, that the ball opened. The cavalry was under a cloud; one regiment, having decided to pass the night at a place midway between Divisional HQ and an important forward position cut down something like a hundred yards of the three pairs of signal cables which formed the main Divisional route in order to use them as picket lines for their horses. This entry was posted in AFV, British, Germany by MSW. Bookmark the permalink.